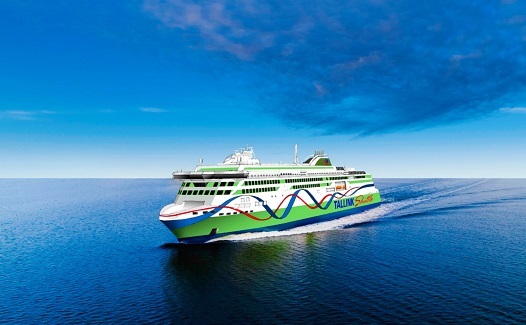 AS Tallink Grupp and Rauma Marine Constructions (RMC) recently signed the contract for the construction of a new LNG-powered fast ferry for the Tallinn – Helsinki route shuttle operations, which enters into force yesterday. Similarly to the group’s newest vessel Megastar (see also CruiseMapper), the new shuttle ferry will also be dual fuel operated, its overall length will be approximately 212 metres and it will be able to carry 2,800 passengers. The vessel will cost approximately 250 million euros and it will be built at the Rauma shipyard in Finland, providing approximately 1,500 man-years of employment for the shipyard. The delivery of the vessel is expected in January 2022. In comparison with the group’s latest vessel, the new ferry will have a larger passenger area with more seating, more crew cabins and, from a technical point of view, powerful shore connection, 30% larger LNG fuel tanks, reducing the frequency of bunkering of the vessel. Further with enhanced new design, the CO2 emissions of new shuttle ferry can be reduced by 10%.